The knife was the first tool invented by humans, be it a chipped rock or sharpened piece of bone. Knives make every other tool possible. The knife is the most primal, useful, and functional of tools, and is most likely used by more people on a daily basis than any other. 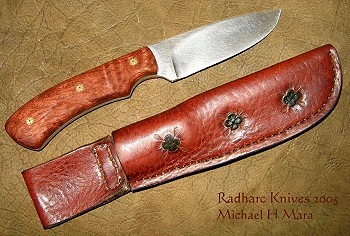 Welcome to the home of Radharc Knives. I am a custom knifemaker that hand crafts a variety of different knives, some strictly utilitarian, and some highly artistic knives. Every once in awhile, I make a very unique, one of a kind knife, as the fancy strikes me. In my knifemaking, I use the finest cutlery steels available (440C, ATS34, 154CM), as well as simple alloy, high carbon steels (1075, 1084, 1095, 5160) for the knife blades, combined with a wide selection of exotic hardwoods from around the world in the handles. The blades are hardened and tempered to a high level of performance, for superior edge holding capability and rugged durability. I hand forge a limited selection of my own Damascus (pattern welded) blades, and enjoy working with customers to design a unique knife just for them. Feel free to browse around the site, and email me with any questions, or to arrange a commission or purchase. 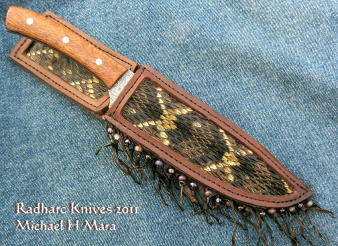 Hunters, how would you like a special knife made with antler scales or a handle, from one of your bucks? 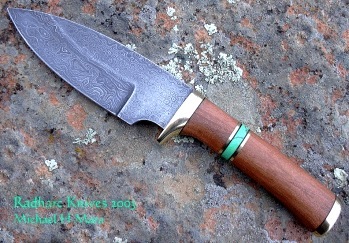 All of my knives are handmade, by me, in the USA. Contact me for pricing and details. I am happy to ship internationally. I have sold and shipped knives to Australia, New Zealand, Britain, Canada, Sweden, Finland, Malaysia, Denmark, Switzerland, Iceland, Germany, UAE, and many other countries. I check first to see if there are any import restrictions in the destination country, and international shipping tends to run between $35 and $95 (with insurance). Legal Note: No knife sales to persons under the age of 18. It is strictly the responsibility of the buyer to be aware of and abide by any and all laws regarding knife ownership in their country, state, county, and city. All content on this site is Copyrighted 2002 ~ 2018.